Does that happens every time you click the button to generate the PDF? Yes happens every time. I tried clearing cache and cookies to see if it may be getting caught there, but no luck. It happens in both dev and live. Well, can you share a view link to your app via private message? Or several screenshots of the workflow actions and element pages that are involved with the PDF creation. @vini_brito Is there a way to share a link as read-only without having to give access via sign up? If not, I’ll just PM you screenshots. Yes, you can go to your app settings, general, application rights and then set that to “everyone can view”, then send me the link of your app’s editor. I won’t be able to change anything, but I’ll be able to see everything. If there’s sensitive data you can create a copy of your app and send me the link of the copy. Can’t wait to get this to work! Really looking forward to it. Thanks again for this. By the way, I’m on the latest version. Just installed the plugin. Hi @vini_brito, thank you so much for this very effective plugin. Left: OK / Right: long email address in 3rd column creates 2nd and 3rd column horizontal alignment issue. It’s not a major issue, but is there any way around this? Well, don’t mind the error message being the same, it comes up for almost anything that can go wrong. The most efficient way for me to know what’s going on in these cases is you sharing an app view link via private message or sharing me screenshots of all the workflow actions and elements involved in creating the PDF, also can be done via private message. I see, that’s a veryvery long address indeed have you tried switching to “fill available space” (if you’re already at it, switching to “fit content”) to see how it behaves? Usually “fill available space” solves content overflowing. Apply this condition to your current “define new style” action and make another one that is exactly the same as your current style, only changing the font size with a >= 20 condition. Or manually splitting the text element into two lines using two text elements through :truncated or :extract on the email. Hey @vini_brito! 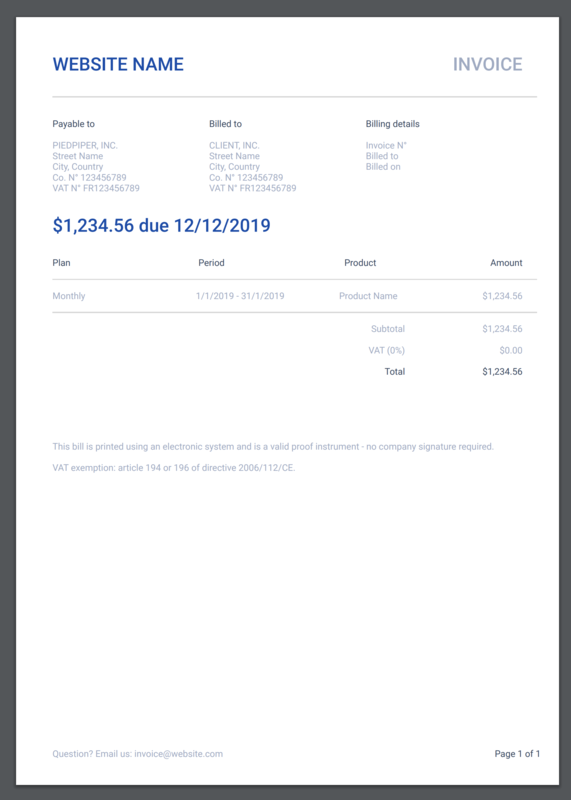 Is it possible to get a editor preview from the invoice that looks similar to @Lucien’s invoice but multiple product rows? I got stuck with showing multiple but limited number of products on a one pdf page. Here is another error that is showing up if this helps at all. I did send you a PM the other day. Still waiting for your response. Love the plugin so far. Can’t wait to get it to work. Looking forward to it. It is working beautifully now. This is really well done work. Thanks you!!! Oh, I don’t really have his invoice’s workflow. I didn’t built anything into the plugin that will report me back people’s models or any sort of monitoring function. Not all is lost anyway, you can still ask him how he has done it, also you can share your current model and we can work on it until it looks how you want it to. Sometimes I find myself stuck trying to create a certain layout, spending a lot of time on it, only to later on realize that I can solve the specific business problem with another layout entirely. You can share with me via private message if you want. Do you have any video’s, or know of anyone who has made one using your awesome plugin for designing the PDF? I want to build a ‘Report’ but am having trouble and not sure where to start. Anything is appreciated! I don’t have any thorough video instruction, nor I know about someone making one. Since this plugin is heavily based on creativity, such kind of video would be immensely useful! As always, I’ll suggest you to start with something simple so you get a grip on the layout engine. Nb: it won’t be easy to adapt it for a number of rows that can vary. Thanks again @vini_brito for making this plugin free for the community! Thanks @vini_brito for providing the PlugIn to the community for free!! I started playing around and what I encountered is if I place a full page background image (A4) to the document the size “explodes” to more than 30 MB even if the original image is only several Kb in size…Any recommendation how I can keep the file size low even when using a backround image? Is it possible in the current version to save the pdf to Bubble database? OK, sorry false alarm…I saw the original image already had 5 MB…Still 6 times the size but I will manage somehow. Although right now I am struggeling by even layering content (z-axis) so one background image and a tabel with content (text & images) on top. Can anyone give a hint?